We planted potatoes a long time ago. Well, it seems like a long time ago. It’s time to dig them out. I dug potatoes in the morning before work. Then dad and I dug potatoes in the evening after it cooled off a bit. These were the short rows of potatoes. 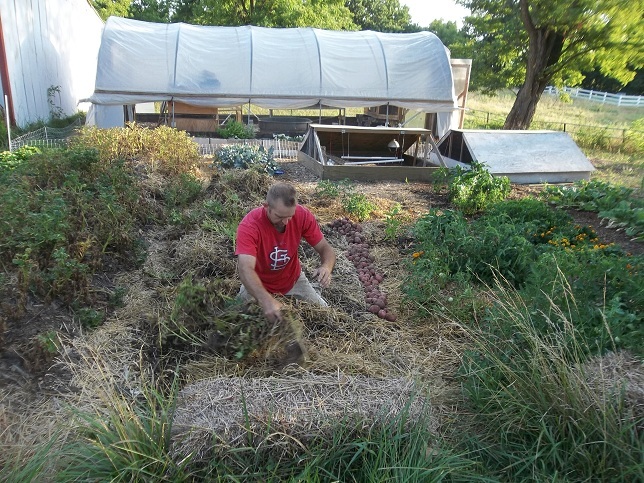 I would estimate I planted 25-30 pounds of seed potatoes in this garden and harvested 200 pounds. Many of the potatoes came up when we pulled the plant out. Very few were down in the soil. The majority of the potatoes were just laying in the hills and it was all hand digging. Who knows how many I missed. I let the potatoes dry off a bit before bagging them up in burlap sacks my sister brought by. We found a tomato hornworm grub and a garter snake as we worked down the evening row. I have an awful lot of organic material on the rows I’ll need to find a home for. Not sure what to plant in these beds for the fall garden but we’ll figure it out. Everything is dry, dry, dry. Hopefully we’ll get some rain next weekend and I can plant again. Let me know how your garden is doing. 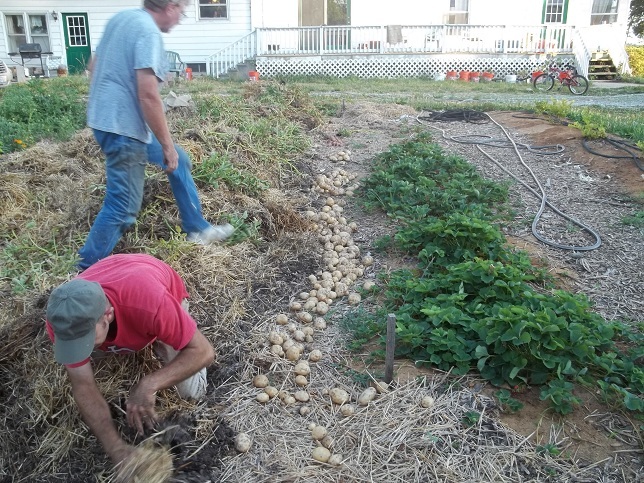 This entry was posted in Gardening and tagged Potato harvest. Bookmark the permalink. So how did you like the John Jeavons way? Will you be doing it again? I think we will. It was a little bit harder to hill the rows but we harvest across the whole row. The yield was pretty consistent, weeds were never a problem and I have heaps and heaps of organic material in the garden. If I had planted in straight rows I could have grown something between the rows but because I planted in the hex pattern I didn’t need as much space to grow my potatoes. Trade offs. I read that you should grow southern peas after potatoes. Have not done that myself, so can’t say how it would work. I looked them up and they have a 60-90 day maturity. Potatoes are flowering and looking good. The peas that the deer didn’t eat are great. Lettuce every night, chives, parsley ditto. First row of carrots ready for thinning, second one coming in nicely. Volunteer kale and chard everywhere in one bed, so I’ve been making a lot of kale chips. Basil is getting eaten by bugs. The fencing to keep the deer out works too well – it keeps me out too – I need to design that much better next year. Your potato crop looks amazing – if these are the short rows, how long are the long rows? I dunno. Longer. I think these are 25′ and the other garden is 40′ but don’t quote me on it. Both are 4′ wide and the plants are staggered on 1 foot centers. Lots of potatoes in a little space.